After the Thames River weaves eastward through London, it widens into an industrial landscape of factories sretching out into the English Channel. 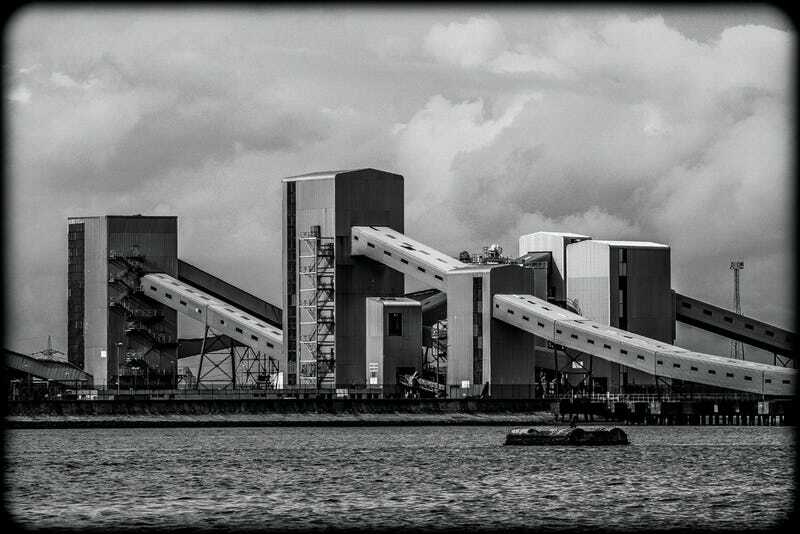 London-based photographer Alice Gur-Arie has documented this landscape in her series Passages: Industry on the River Thames, a collection of beautiful black and white photographs depicting the hulking structures that rely on the river for survival. Because many of the buildings are inaccessible by land, Gur-Arie must capture her subjects by boat, like a wildlife photographer stealthily tracking animals in their natural habitats. After envisioning her on a photographic safari, I started to see the factories more like large and endangered creatures—which is how Gur-Arie also sees them, describing them as "complex anthropomorphic organisms, systems of independent parts that dance to their own rhythms." And they all seem to have their own personalities, too: "Windowless towers that seem defiant, angled mechanical arms somehow adolescent, conical silos lined up like soldiers on parade." What's also notable about Gur-Arie's subjects is that, due to the scale of the structures and the distance she must maintain in order to capture them, there's almost no sign of the presence of human beings. In essence, these are actually living, breathing, steam-belching creatures that are being monitored by a handful of unseen operators. I asked Gur-Arie about what draws her to these industrial giants and how she manages to capture them. Gizmodo: What intrigued you about the industry on the lower Thames? Alice Gur-Arie: I have traveled down the River Thames many times, always struck by the number of large industrial estates that dominate the landscape and edge the river from Greenwich to the open sea. From the river—my vantage point—the networked structures can be seen in their entirety, striking in their scale, dominance, and awkward yet intriguing designs. Did you capture all these images by boat? I took these pictures from our boat as we progressed on a journey from Oxford to Ramsgate, on the southeast coast of England, about 10 miles from Dover. This vantage point—indeed the experience of seeing one industrial site after another—would not be possible from land, and, for most people, would not be familiar. Do you do any research about what the structures do? I do not have specific information on the factories—there was no evident identification of the companies and therefore it is impossible to discern the exact nature of their operations. I assume these businesses established themselves on the banks of the Thames for convenience. The River Thames has always been a working river, and today offers both transportation and water for cooling. As you travel towards the Thames Estuary you see huge wharves and walls to which enormous ships tie up; small sailboats and commuter river taxis frequent the upper part of the River Thames, but this is how the lower part of the river is used today. What is it about the structures that draws you to them? All of the images fascinate me. The intricate network of wire and steel compel closer scrutiny, the graphic connectivity of line and curve spark my curiosity, the depth of black and white creates shadows that I want to explore, and the textures and shapes set against dramatic clouds make me want to reach out and touch what my eyes take in. Although I'm sure there are many people there, it seems abandoned and vacant. That's exactly what I was thinking—it feels empty, but you do think these are all still working properties? I believe the estates are active, but it may be that they are not growing. This is consistent with the shift from manufacturing to service, but the facts and figures are not at my fingertips and would need to be confirmed. The landscape looks and feels empty because this type of manufacturing is highly mechanized; it is likely that there are people inside the buildings. From a technical perspective, I needed a wide angle to capture the whole image, so a human form simply would not be evident in this scale. And as you mention, the skies also add so much drama to each photograph.